Sprinkler Blowouts Fort Collins - Winterize Your Landscape | Advanced Landscaping & Sprinklers, Inc. If your Fort Collins home or business has an irrigation or sprinkler system installed, it’s critical to winterize or blowout your system before the cold weather arrives. Without a proper sprinkler blowout, you run the risk of broken irrigation pipes, which can have a negative effect on your sprinkler system, lawn and property. 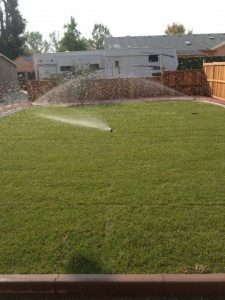 At Advanced Landscaping & Sprinklers, we’ve helped hundreds of Colorado residents successfully blowout their sprinklers and we’re proud to be a Top Rated Local® landscaping company throughout Colorado. Contact our landscaping and irrigation experts today to schedule your sprinkler blowout! Our irrigation specialists understand that no two sprinkler blowouts are alike, which is why we’re dedicated to creating a customized winterization plan to fit your landscape’s needs and budget. If you’re looking for a dependable and professional landscaping company in Fort Collins, contact the experts at Advanced Landscaping & Sprinklers today!